This entry was posted on January 27, 2012 by darthbergen. It was filed under Uncategorized and was tagged with All-Stars, Batman, Chucks, Converse, Fashion, Hope, Life, Photo, photography, Photos, Pictures, Positivity, postaday2012, Random, shoes, Weekly Photo Challenge, Wordpress Photo Challenge. Yeah, me too. 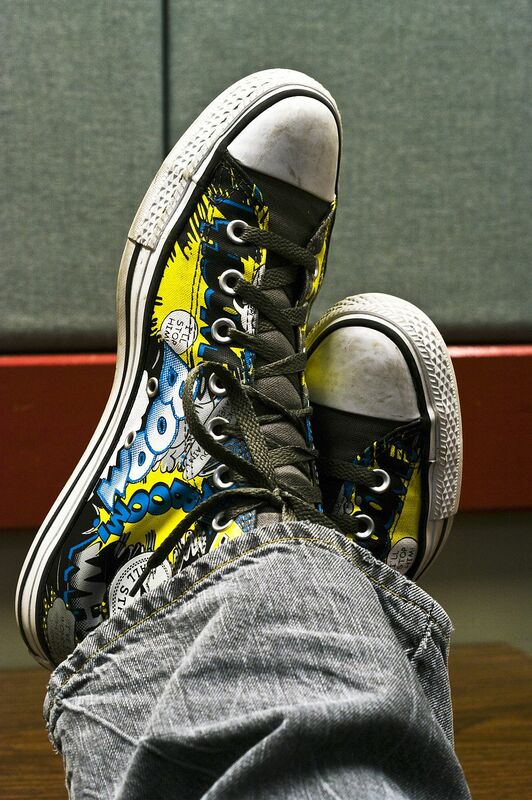 Chucks are great in the first place, but to add Batman? That just makes them the greatest shoes I’ve ever owned. Esperanza…the real deal, or the real thing! Good one. In Jeremiah it says: I know the plans I have for you…plans to give you a hope and a future. And ajeremiah was living in really, really rough times. I’ve read Jeremiah, too, and I hope my situation is not as dire as his. Love the photo and the accompanying text. Great job. Thanks. They’re a Journeys exclusive DC Comics edition – one of three different Batman styles. I hope I can still find the other two styles someday. Craptastic . . . I’ll have to remember that word. LOL. Sounds like one that should be in the dictionary. It’s one of many words I have adopted to curb an occasionally dirty vocabulary. It’s also really fun to say. Love the photo and your words. It’s true, why dwell on the past or day dream about the future, but go out there and make it happen! Great capture of your shoes; really, very sharp and colorful.